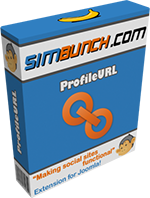 ProfileURL 3 has been released. It now supports Joomla 2.5 and 3+, and is written using the Joomla! MVC architecture. Yes! Finally, the long awaited update is here! ParaInvite 4 is a major rework from the previous version. Written from to support Joomla 3+ (including Joomla 2.5), Parainvite 4 packs some serious features! 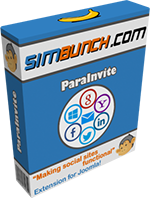 ParaInvite 4 comes with a upgrading component for users with ParaInvite 3.5 installed. If you're upgrading, DO NOT install ParaInvite 4 first! Install the upgrade component, let the upgrade process complete, then install ParaInvite 4. Oh Em Gee It's SIMGallery 4! Yes! Finally, the long awaited update is here! 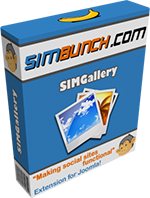 SIMGallery 4 is a complete rework from the previous version. Written from the ground up with a spanking new interface, SIMGallery 4 packs some serious features! SIMGallery 4 comes with a upgrading component for users with SIMGallery 3.2 installed. If you're upgrading, DO NOT install SIMGallery 4 first! Install the upgrade component, let the upgrade process complete, then install SIMGallery 4. SIMBunch is now Joomla 2.5! We have just successfully migrated SIMBunch.com to Joomla! 2.5 (all the while holding our breaths!) Phew! Even though we seem to have everything covered, but you can't be too sure! So to be safe, we apologize if anything appears to be broken, AND we would REALLY appreciate it if you can let us know! Send us a feedback and we will fix the problem ASAP! This is something I found out recently, and may be of interest to other developers.